Emotional footage shows an elderly couple broke into tears after their son and daughter-in-law surprised them with a refurbished granny flat. 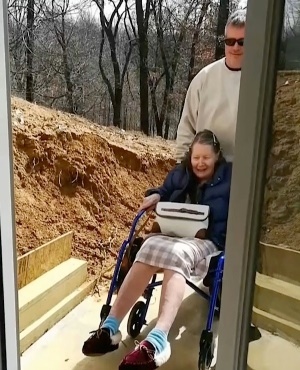 Bonnie and George Miller (both 87) found out their son, Schon, and daughter-in-law, Jeannie, had turned their basement into a new suite for them to live in. Schon and Jeannie will now be able to help the couple with everyday tasks as they all share the same household in Bremen, Ohio – rather than the pensioners having to move into a care home. As they entered old age, Bonnie became physically weak and George’s mind started to slip. They relied on each other to function as normally as possible. Schon knew how much his parents loved and needed each other, so he couldn’t bear the thought of them ending up in a nursing home. When Bonnie fell and broke her shoulder, Schon and Jeannie started exploring other living options. “We’d been talking about it with mom for a while because we knew they were leaning on each other. “One can’t live alone without the other and we didn’t want either one to end up in a nursing home. They subsequently turned their basement into a fully furnished and functional suite just for his parents!